The inmates of Itikaf City spent nine days with full dedication, religious fervor and in remembrance of their Lord. The special addresses of Shaykh-ul-Islam Dr Muhammad Tahir-ul-Qadri on the Holy Quran, spiritualism, morality and contemporary social issues were the chief highlight of the Itikaf City, which enriched people’s knowledge of Islam. Dr Hassan Mohi-ud-Din Qadri, Sahibzada Faiz-ur-Rehman Durrani, Khurram Nawaz Gandapur, Sahibzada Hammad Mustafa al-Madani and Sahibzada Ahmad Mustafa al-Arabi and the management of Itikaf City saw off the residents of Itikaf City. 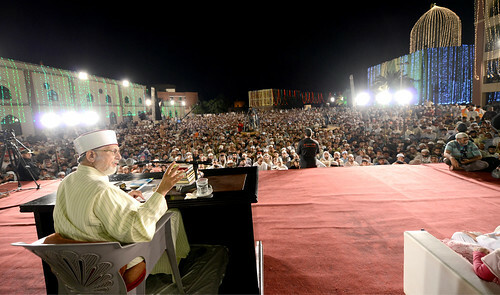 Dr Muhammad Tahir-ul-Qadri delivered a brief talk in the concluding session of Itikaf. He advised the residents of Itikaf City to continue to perform all worships they had the honour of performing during Itikaf. He said that worship of Almighty Lord creates enlightenment in the heart and this enlightenment becomes pure with the embellishment of love of the Holy Prophet (peace and blessings be upon him).